We are one of the leading manufacturer and supplier of Expanded aluminium mesh.We obligated to meet the quality standards as per the customer demand. 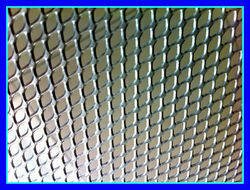 This Aluminium wire mesh is designed precisely to make sure that they comply with the industrial specifications. Our clients can avail this aluminium wire mesh in different grades and dimensions that suit best with their demands and requirements. Our range of products is widely accepted to meet the varied industrial requirements in different fields. ASTM B2111100 is a non-heat-treatable aluminium alloy. It is soft and ductile with excellent workability as the most weldablealuminium alloy. Cold working increases its strength. 1100 exhibits excellent resistance under severely corrosive conditions. Aluminium 1100 wire mesh is great for use when electrical conductivity is required. This aluminium is often used for decorative architectural trim, screens, grills, cold-headed and cold-threaded parts. ASTM B2331350 is a non-heat-treatable aluminium alloy. It is composed of minimum 99.5% aluminium. Cold working increases its strength. Often used for electrical conductivity. ASTM B211, AMS-QQ-A-2253003 is a non-heat-treatable aluminium alloy. Due to its composition, 3003 is approximately 20% stronger than type 1100. Cold working increases its strength. It is readily worked and contains magnesium for excellent service under severely corrosive conditions. ASTM B2115052 is a non-heat-treatable aluminium alloy known for its durability. Cold working increases its strength. It contains magnesium for excellent service under severely corrosive conditions. 5052 is especially resistant to marine atmosphere and salt water corrosion. 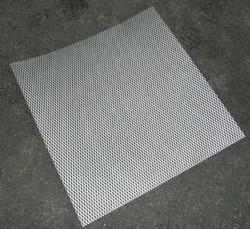 Aluminium 5052 Wire mesh is often used for marine and chemical industry application. ASTM B21, AMS 41825056 is the strongest non-heat-treatable aluminium alloy. Cold working increases its strength. It contains magnesium for excellent service under severely corrosive conditions. While strong, this aluminium is quite ductile and serves great for wire screens and fasteners. ASTM B2115154 is a non-heat-treatable aluminium alloy. This aluminium has moderate strength, excellent formability, and corrosion resistance. It is great for cold heading applications. ASTM B211, AMS QQ-A-225/8 6061 is the most versatile heat-treatable aluminium alloy. It has excellent corrosion resistance, strength, and formability. Often used in a wide variety of mechanical applications such as fasteners, fittings, marine, aircraft, and aerospace uses. Looking for Aluminium Wire Mesh ?